Here are the monthly premiums people would pay at varying income levels and family sizes for the benchmark plan – the second-lowest-priced silver-level plan in the individual marketplace. The government will pick up any remaining amount and the advance tax credit will be paid directly to the insurance company by the IRS. 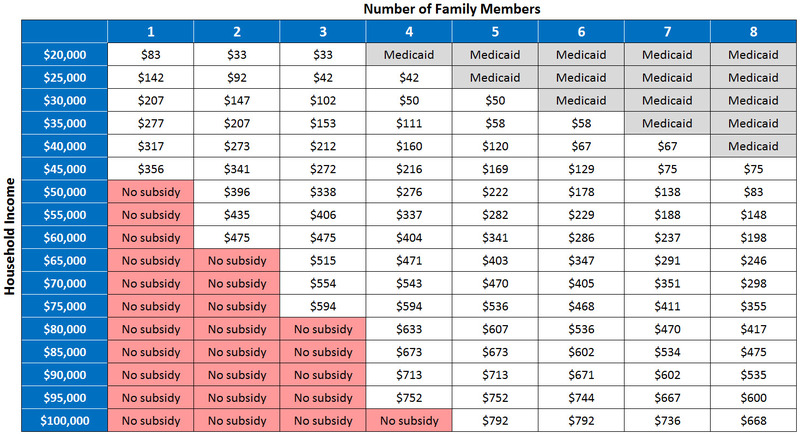 Note: Medicaid qualification based on 100% of FPL. In states with expanded Medicaid, families with higher income levels than those indicated on the chart may also qualify for Medicaid.